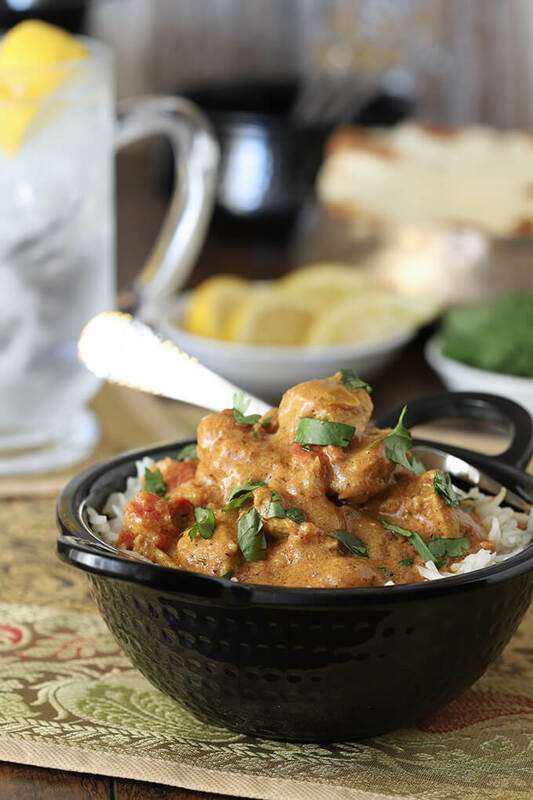 When the mood strikes for Indian flavors, try this Easy Chicken Curry served over Basmati rice; it’s warming spices make this a quick and delicious dish. It’s snowing in Colorado for the second day in a row. It’s not amounting to much but still; it is snow and clearly winter is coming. We typically have nice fall weather, albeit with pretty chilly nights, until after Halloween. Is this it? I hope not; I still have some tulips to plant and yard cleanup to do; it just can’t be! 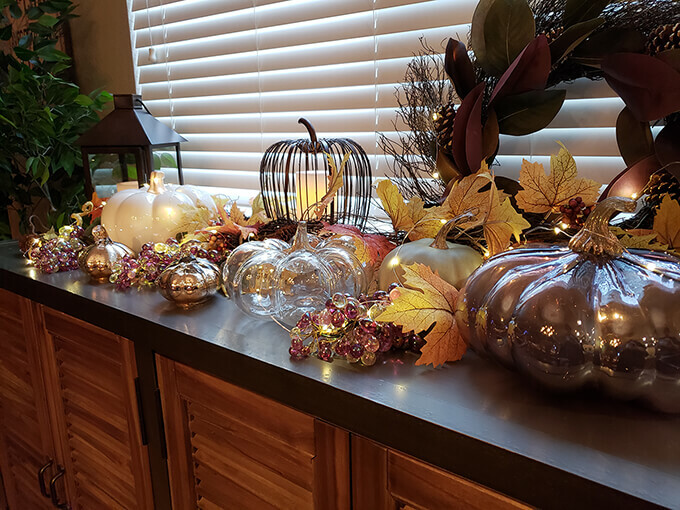 I have been busy with lots of home projects including Fall decorating and I’ve added to my collection of pumpkins and am so pleased with how this table turned out; it will be good from now until the day after Thanksgiving! This early chill is a bit disconcerting thought; I am a fanatic about some things and conserving energy is one of them. I cannot remember when I’ve turned my furnace on before November 1st and I’m not about to this year. So I survive with an OLD favorite men’s sweater, some thick socks, multiple blankets, and lovely, warming food. This dish fit the bill perfectly. This easy and warming chicken recipe was first published on my blog what seems an eternity ago; in 2010. An old friend, Jamie Schler, had just been a part of a food blogger conference in London (lucky!) and had shared this wonderful dish made by the equally lovely Meeta from www.whatsforlunchhoney.net. 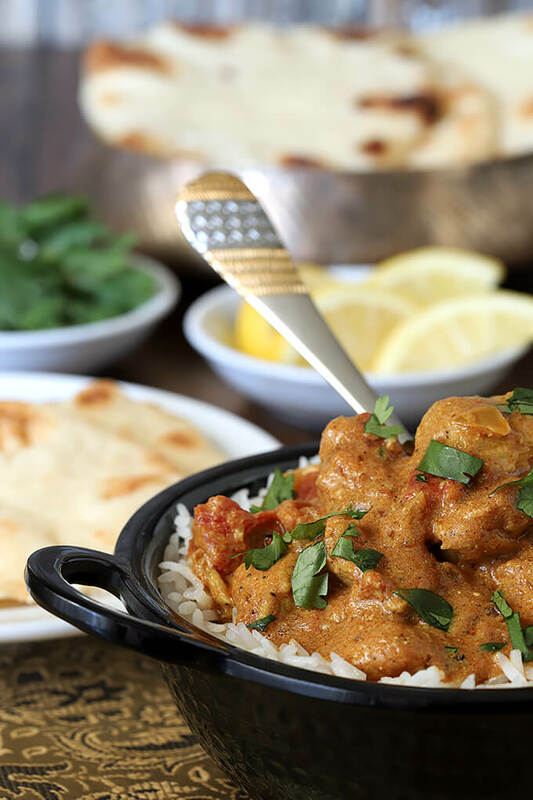 I am crazy about curry…especially since the opening of a local spice shop that offers the freshest and best spices imaginable…so I stopped in my tracks and had to make this dish stat! I also love this Japanese Curry when I’m in the mood; but it requires carrots and potatoes, not something I always have on hand; so this was very up my alley. Easy is key; it comes together quickly; especially since I usually make it when I’ve got leftover chicken instead of starting with fresh chicken parts like Jamie and Meeta did. I’ve become so enamored with Indian food and you’re going to see more of it on these pages. Honestly; find a good spice resource and the rest is easy; Savory Spice Shop is now online so anything I can get, you can too if you can’t find it locally. I do think using a good blend of spices for your curry seasoning is important; the can at the grocery store pales in comparison to a good product. Honestly, once you find a resource for some spices and hot peppers…almost anything Indian is possible! Evidence of how much this appealed to me all those years ago? I had a party planned that evening with 30 guests and I was making something that I didn’t plan to serve to them…was I nuts? I was lucky to have JUST (I mean, that morning!) cooked some chicken breast meat but I’ll also use a roasted chicken and shred it. I don’t know about you but it seems I will often get inspiration from food expiration dates, as in, OMG it’s going to go bad, I HAVE to cook something with it and that did get me moving yesterday morning. I’ve been in an Indian mood lately and I can’t deny that choosing this dish was partly to replace the really old, really bad photographs that were living in these blog pages. I used to include the old photos when I did a redo but I would sort of like to forget that period when I knew absolutely nothing about food photography and was using an old point and shoot camera. Just trust me, they’re bad. If you click on that link above for Japanese Curry, you’ll see. It’s next! 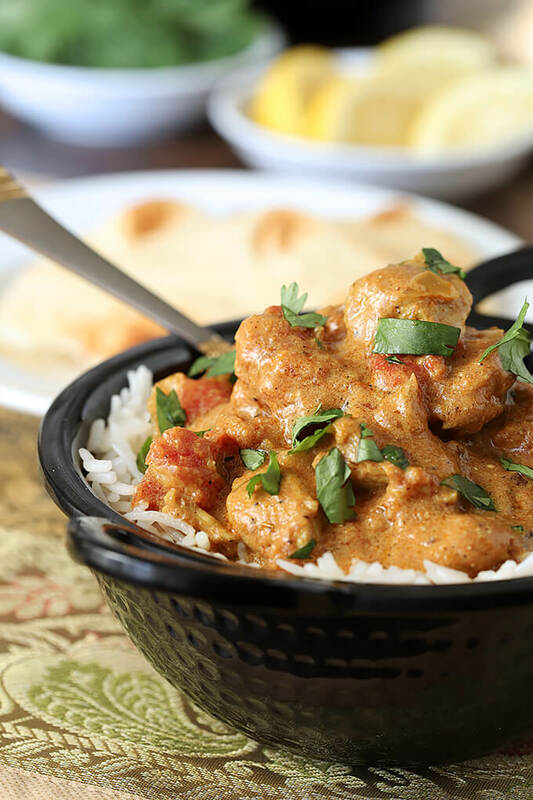 I didn’t know when I sauteed those chicken breasts in butter that I would have the delicious aroma of curry wafting through the house later in the day – but that’s exactly what did happen and with the chicken already cooked this was soooo easy. Jamie’s recipe used whole chicken pieces but I’ve revised it to suit my already cooked chicken. So easy and so good, thanks ladies! A nod to my neighbor Parul too…she brings me the sweetest gifts when she goes home and visits family in India; knowing I love using them in my photos. The bowl and the linens make my forays in this direction that much more authentic…and somehow more delicious too! 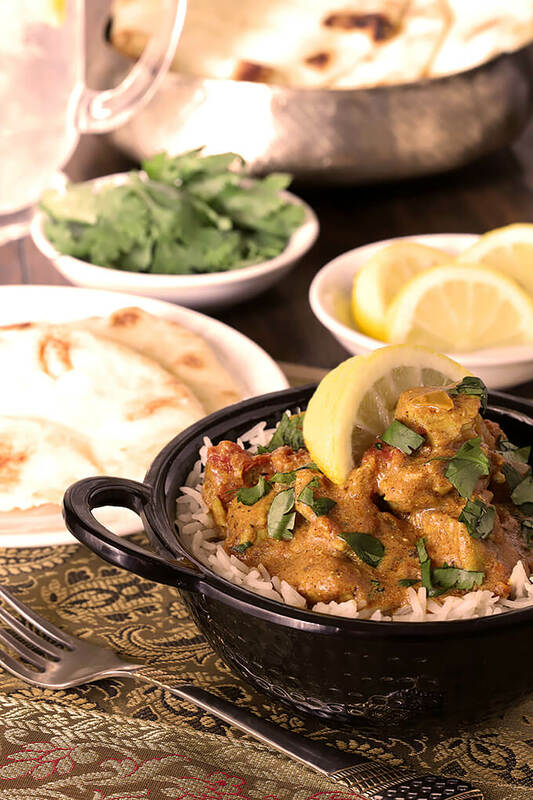 A curry spiced chicken dish that is easy to prepare and so delicious! Cook the basmati rice first. Remove from heat, fluff and cover when finished to keep warm. Add the oil and the chopped onions to a skillet and sauté, stirring often, until tender and golden brown. Add the chopped garlic and continue to cook for another minute or two until the garlic is tender; stirring often. Stir in the tomatoes, add the spices and the salt and pepper, stir until blended and simmer for 20 minutes. Add the cooked chicken to the pan and continue simmering on low heat for another 10 minutes. Add the yogurt or sour cream to the pan and mix thoroughly; adjust amount to your preference! Taste and adjust seasonings; squeeze in one or two squeezes of lemon juice to brighten the flavors and you're done! Turn off the heat and cover. Allow to sit so the flavors meld a bit. Before serving, gently reheat if necessary and serve over basmati rice. I’ve never had curry. Not even a taste. I think I’m the only one on the planet Earth that hasn’t tried it yet. I don’t know why. I guess I’m afraid it will taste and smell like cumin ??? But, I do adore my Savory Spice Shop ♥ We’re having a home built out of state so we just sold (what I thought was my forever dream home) house and a newly remodeled kitchen. My spice drawer was the enjoy of everyone. Filled with Savory Spice Shop bottles on an Ikea drawer insert. sigh…..its just not the same in a rental. Not like Cumin at all Tracy and I like cumin. Curry is actually a blend of spices so it can take on various taste profiles; you should visit SSS and try some samples. But this is GOOD…it would be a great dish for you to try! I loved 5 years ago; hard to believe. I loved my old home and had worked for over 20 on the yard and it was a gorgeous haven. Then I broke my left leg and life changed; it’s never been quite the same so a move to a ranch house became a necessity…it took awhile and I had to live with friends for 8 months (she was a friend; he was AWFUL!). But I love it here now; have some great neighbors and while I will always miss my yard…I sure love having wonderful neighbors even more. Best of luck to you! Curry? I’m in! Love the stuff. And love easy, too. This looks wonderful. Perfect for snowy weather. Or what we have today — crisp, cool fall weather. First day that it’s actually seemed like fall. Soup weather! Or curry weather. Anyway, good stuff — thanks. If I could have a freezer full of curry and dal meals I think I would be in heaven; I know it’s crazy to have taken me so long but still exciting to have cracked a bit of the Indian code even this late in the game!